When the weather is nice, many runners are motivated to kick it into high gear. There’s no shortage of physical activities to enjoy in the summer sunshine (think trail running, hiking, kayaking, swimming…). Beautiful days beg for runners to lace up and run their city or town’s best routes. But keeping a schedule full of vigorous activity only works if runners give equal thought to active recovery. If you’re somewhere in the 40-plus age group, recovery is even more important. If those aches and pains– or perhaps even an injury– have been getting you down, we have a wise guide that’ll have you bouncing back in no time. Take this advice from our experts and age will no longer be a limiting factor. When getting in from a run, the first thing a runner should be concerned about is hydration. Dr. Greg Wells, a well-respected sports physiologist, firmly suggests that runners steer clear of sugary sports drinks. Stick with water and if you must, add a dash of lemon, salt and honey. Then focus on recovery foods. “At that point, eating real food is great– as in, it shouldn’t come out of a package,” says Dr. Wells. Megan Kuikman, an Ontario-based runner and registered dietitian, echoes this idea. While she hates to be the bearer of bad news, it needs to be said: the post-run beer is doing you no favours. “It’s a diuretic which will make you more dehydrated,” she says. 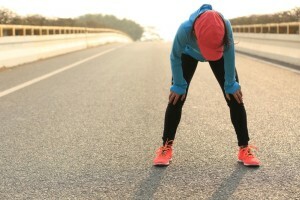 While this piece of information applies to runners of all ages, she emphasizes that it’s even more pertinent to masters athletes since they don’t recovery as quickly. So what is the proper food to eat after a run? “Specifically after a workout, there are three things to focus on: carbs, protein and fluid,” says Kuikman. Need specific ideas? A few smart options that Kuikman suggests include pita, tuna and veggies; rice, chicken and veggies; or a fruit smoothie made with yogurt. Because increased age often comes with increased responsibility (childcare, long hours at work, appointments, house work), she also advises that people in the over-40 camp take the time to prepare their recovery meals early in the week. Don’t overdo it though. Kuikman suggests eating within half an hour after coming in from the workout. “One of the biggest problems is that a lot of people don’t feel hungry after so they neglect that period and eat more later on,” she says. If you’re trying to lose weight, she says, it’s best to plan for a meal after the mileage so you don’t end up eating a snack followed by a large dinner later on. Cut down on the hours spent snoozing and you’re really just cheating yourself. As Dr. Wells explains, the human body releases a growth hormone during sleep. “It’s a chemical released that circulates around your body and interacts with cells. When it does that, it stimulates them to repair and rejuvenate.” He adds that as people age, testosterone production decreases meaning that our bodies don’t repair themselves the same way they used to. That makes sleep extra important for those in this age group. Where a person may have been able to get away with a stingy night of sleep in theirs twenties, in later years, that just won’t fly. Back off if you’re going through a particularly rough patch.”If you had a brutal time at work or are going through a difficult time at home and you do hard workouts, you’re going to get sick,” says Dr. Wells. “The point is that you need to adapt and manage your total life stress.” One final reminder: Keep in mind that sometimes a hard workout does not move you forward, but rather, it does the opposite and recovery then suffers. “If you want to reach your potential at any age, we need to spend time in the gym getting strong,” says Dr. Wells. Cross-training should be routine for runners, particularly the older ones in the group. “You need to do other things to allow your body to run for a long period of time throughout your life.” One activity he suggests specifically is Ashtanga yoga because it improves both strength and flexibility. SierraSil is meant to increase joint function. For athletes looking to bump up the intensity or for masters runners struggling with mobility, SierraSil products aim to better joint health so you can comfortably increase endurance and recover from said physical activity afterwards.